I always enjoy a good soup. It’s not only warm and filling but also full of all those wonderful nostalgic feelings of childhood too..
Now that’s even twofold when you or a loved one is feeling under the weather..
Whose Mom hasn’t cooked up anything from Lipton’s to Campbell’s to Cup of Soup when you were home sick from school with a cold as a kid.. I know mine did many a time..
Now my poor Sweetie has been run down and feeling blue from a bad bout with bronchitis, an you know there’s nothing fun about feeling sick like that.. 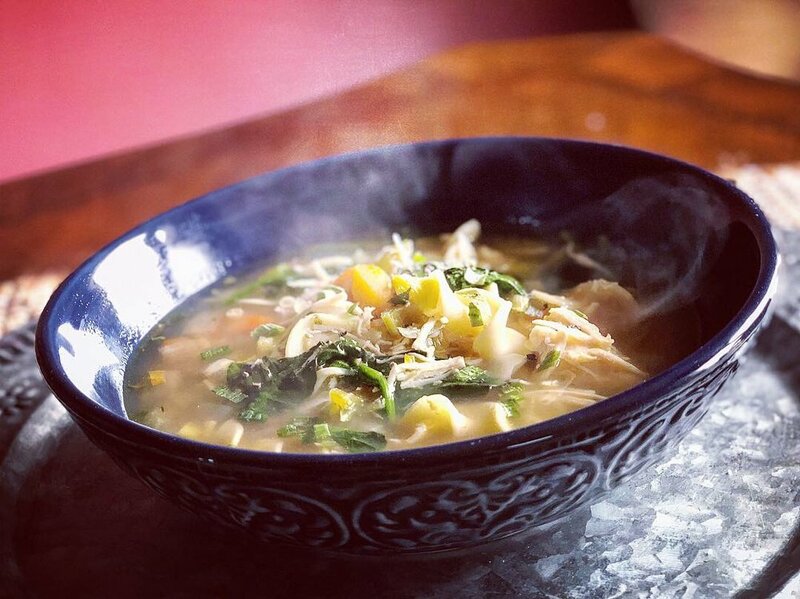 So what I decided to do was get together a hearty mix of vegetables and chicken and slow cook up this delicious and nutritious “Crock-Pot Chicken Soup” to help her heal and feel better.. Using extra veggies, spinach, chicken bone broth, Himalayan salt, herbs and organic white meat chicken breast with a small amount of pasta I made this tasty meal..
Full of protein and nutrients without a ton of excess carbs from an overload of pasta allows you to fill up on this soup without filling up on the unnecessary calories.. Even better you can prep everything the night before in the crock pot, take it out of the fridge and then set it and forget it while you go about your day at work or in the home then just toss it with the pasta that night.. This dish definitely eats like a meal, so give it a try in your house today..
To the bottom of a 6 quart or larger slow cooker, add olive oil and garlic on high temperature setting. Stir then let sit as you prep, slice & chop your other ingredients. Top with the onion, carrots, celery, dried thyme & crushed dried rosemary. Add bone broth then cover and cook on LOW for 6 to 8 hours, or HIGH for 3 to 4 hours. Cook egg noodles in a large pot according to package directions. Strain & set aside. Pour vegetables & broth into the large pot you cooked the egg noodles inside. Then shred the chicken in the slow cooker using two forks. Dump the chicken into the pot with the veggies and broth. Turn heat up to medium and bring to a simmer. Add egg noodles to soup and cook on medium for 5 minutes to allow flavors to blend. Add 2 tablespoons of your chopped parsley and the baby spinach to the pot. Stir together. Taste, adding salt or pepper if desired. Then cook about 5 minutes more. Serve garnished with minced fresh parsley, chopped spring onions and a sprinkle of fresh cracked black pepper. 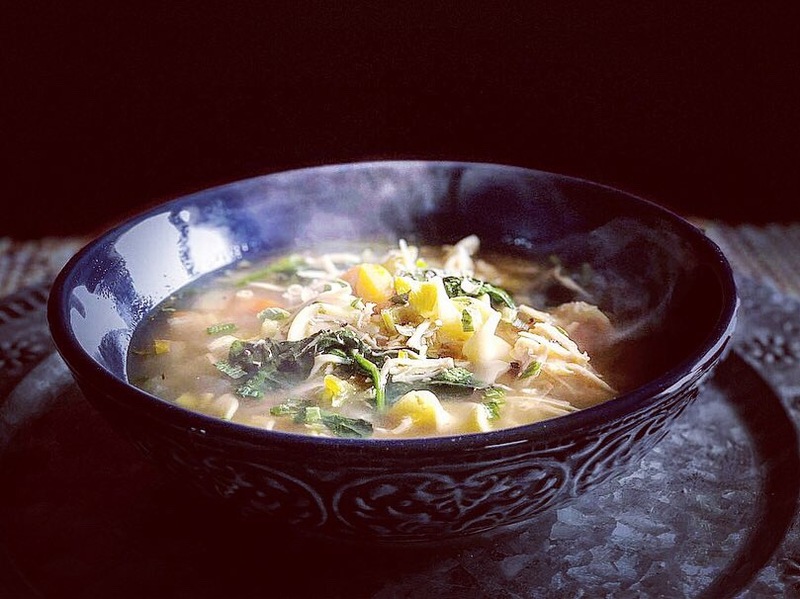 I use extra vegetables, chicken and chicken bone broth with less noodles for the higher protein content, lower carbs and more nutrients. I keep the light leafy greens in the center of the celery bunch too, slicing it with everything else and adding to the soup in the crock pot. Better then bouillon is my fave base but if you have a preference you can use that. Taste could differ slightly. if preparing the night before to cook the next morning then don’t turn on crockpot for the beginning steps. Just prep everything and have it ready in your ceramic crock pot bowl and cover tightly till taking it out of the fridge about an hour before heating in the crockpot.